Orff Schulwerk is a way to teach and learn music. It is based on things children like to do: sing, chant rhymes, clap, dance, and keep a beat on anything near at hand. These instincts are directed into learning music by hearing and making music first, then reading and writing it later. This is the same way we all learned our language. Orff Schulwerk is designed for all children, not just the privileged, talented, or selected few. There is a place for every child and each contributes according to his/her ability. Orff Schulwerk happens in a non-competitive atmosphere where one of the rewards is the pleasure of making good music with others. When the children want to write down what they have composed, reading and writing find their moment. Orff Schulwerk uses poems, rhymes, games, songs, and dances as examples and basic materials. These may be traditional or original. Spoken or sung, they may be accompanied by clapping and stamping or by drums, sticks, and bells. The special Orff melody instruments include wooden xylophones and metal glockenspiels that offer good sound immediately. Played together as in a small orchestra, their use helps children become sensitive listeners and considerate participants. With Orff Schulwerk, improvisation and composition start students on a lifetime of knowledge and pleasure through personal musical experience. Learning is meaningful only if it brings satisfaction to the learner, and satisfaction arises from the ability to use acquired knowledge for the purpose of creating. For both teacher and student, Orff Schulwerk is a theme with endless variation. The title "Schulwerk" is an indication of the educational process taking place: Schulwerk is schooling (in music) through working, that is through being active and creative. Composer Carl Orff and his associate Gunild Keetman evolved the basic texts for the Schulwerk as models for teachers worldwide. Now translated into eighteen languages, Orff Schulwerk is based on the traditional music and folklore of each country in which it is used. At present more than 10,000 teachers in the United States have found the Schulwerk the ideal way to present the magic of music to their students. 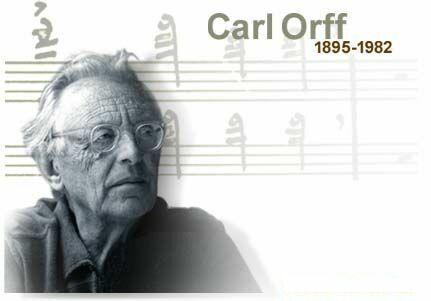 Born in 1895 in Munich, Carl Orff began piano studies at the age of five under the tutelage of his mother. The boy's great interest in language and poetry were fostered in school, where classical languages and literature were among his favorite studies. He received his formal musical training at the Akademie der Tonkunst in Munich. From 1915 to 1917, Orff was musical director of the Munich Kammerspiele, an experience that had a profound effect on his later work. Upon the advice of his mentor and friend Curt Sachs, he soon immersed himself in the study of Renaissance and early Baroque composers, most notably Claudio Monteverdi. In 1923 he met Dorothee Gunther, who envisioned the founding of a school for movement, dance, and rhythmic training. The idea of a training in elemental music - a music which is not abstract, but which integrates the elements of speech, movement, and dance - emerged and took shape in his discussions with Gunther. In 1924 they founded the Guntherschule in Munich. Core studies, taught by several instructors, included gymnastics and dance. As musical director, Orff was responsible for the musical training of the students. Orff began with rhythm as the basic element inherent in music, dance, and speech, combining them and unifying them into one language. Improvisation and creation were at the center of his teaching. Because a number of his students had not had previous musical training, he emphasized body sounds and gestures for rhythm, and he used the voice as the first and most natural of instruments. He gave great importance to the drum in all its variations of size, shape, and sound. He made the ostinato (a repeated rhythmic, spoken or sung pattern) serve as the form-giving element in all improvisations. Gunild Keetman and the dancer Maja Lex joined the school as students in 1926 and 1925 respectively. Orff regarded both of them as gifted equally in music and in dance; soon they became colleagues and partners in his search for an elemental expression in music and dance. Keetman's collaboration in particular proved to be of immense value in the development of the instrumental ensemble and its musical style. During the late 20's, with the invaluable help of Karl Maendler, the barred instruments (which today are simply referred to as "Orff instruments") were designed and built for the school. In 1930 Lex and Keetman founded a dance group and orchestra with students of the Guntherschule which became widely known in Germany and abroad. That same year saw the appearance of the first publications. Orff was well aware that publishing brought with it the danger that the purpose of the books would be misunderstood. Born out of improvisation, the fluid medium of elemental music does not adapt well to the static medium of print. On the other hand, he realized that only through publication could its educational value be made known. Beginning in 1931, lectures, demonstrations, and training courses began to draw the attention of music educators in Germany to the work at the Guntherschule. But during the 1930's and 40's, Orff's approach to music pedagogy was declared in conflict with the prevailing ideological and political climate in Germany. A number of his published works were dropped from publication because he had used poems by writers no longer acceptable. In 1944 the Guntherschule was closed due to political pressure; the building and most of its inventory were completely destroyed by bombing. Between 1935 and 1942 Orff created his first "mature" stage works: Carmina Burana and the two Grimms' fairy tales Der Mond and Die Kluge . These works are of direct interest to the Schulwerk teacher because of their stylistic relationship to the musical language of Orff Schulwerk. After the War, Orff was contacted by the Bavarian Broadcasting Company and asked whether he could create a series of broadcasts for and with children. His initial doubts were soon replaced with enthusiasm, realizing that the task would renew his long-abandoned dream of music education reform. He engaged Gunild Keetman to assist in the planning and to work with the children. In September, 1948 the first program was aired. Teachers, parents, and children demanded more, and an extended series was presented. Between 1950 and 1954, Orff and Keetman wrote down the pedagogical concepts that had grown out of their work with children. When they had finished, they had written five volumes: Schulwerk, in its re-creation and transformation, had become Music for Children. Radio broadcasts lacked the possibility of including the movement aspect, fundamental to rhythmic development. In 1949 Keetman was invited to teach children's courses at the Mozarteum in Salzburg, Austria. Now movement training could be systematically incorporated into Orff Schulwerk. By 1953, comprehensive teacher-training courses were offered at the Mozarteum. In 1963 the Orff Institute was opened; still a branch of the Mozarteum, it functions today as an international training center as well as the focal point for Orff Schulwerk all over the world. At the core of Carl Orff's work is a kind of musical expression that is able to speak to children without the loss of musical integrity. Therein lies its great significance, its genius.